Imagine driving out into the desert, turning on a dirt road that leads to a primitive, rougher dirt road, which leads to a "parking" area full of adventure rigs, tents, truck campers, vans, bikes and dirtbags. 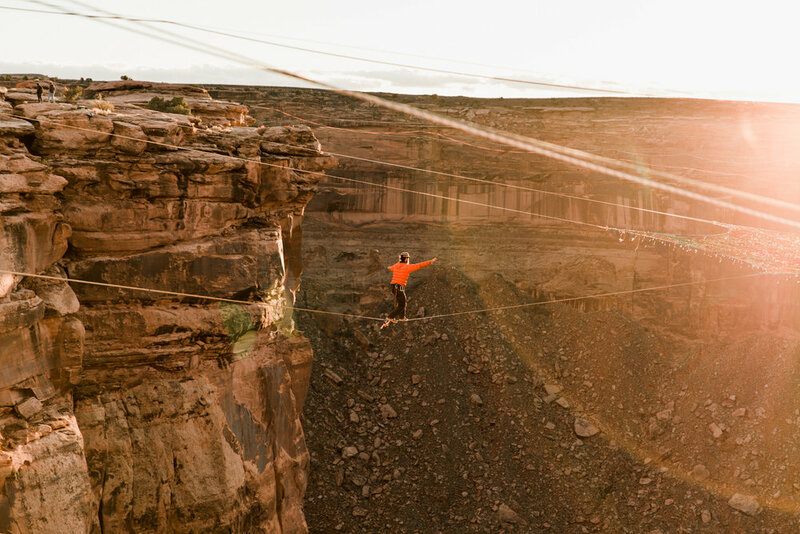 From there, you follow the trailhead a short 1/4 mile to the cliff edge, a 400-foot drop into the canyon below and a perfect bowl that looks like it was made just for high-lines, which are essentially tight ropes made of webbing stretched from edge to edge, ranging from 20 feet long to 750 feet long. On one line, there is a girl in a velvet lion costume balancing in the middle while a few lines away from her a guy causally walks across in his robe. A few people walk by with small backpacks on and before you can come up with why their backpacks might have seatbelt-looking chest straps and leg loops on them, you hear a holler and a loud crack...someone just leapt off the cliff a few feet away and is now peacefully flying under a large parachute to the ground below. 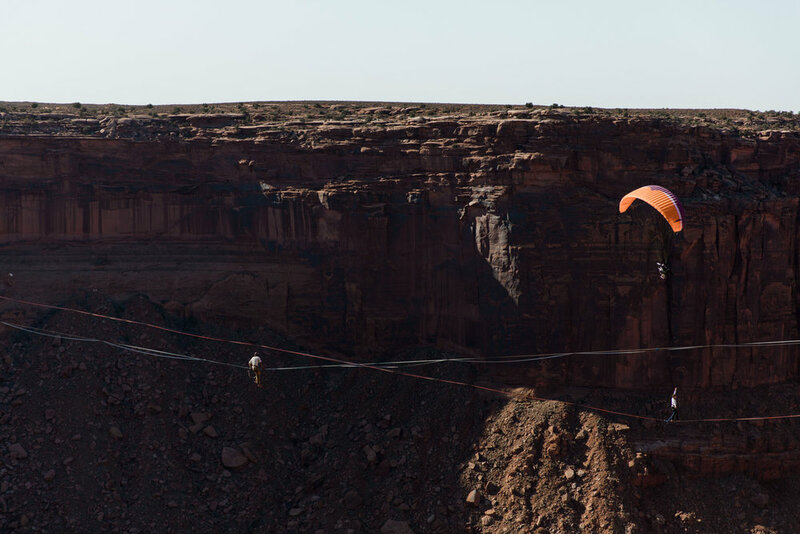 A few minutes later, distracted by the sound of drone cameras buzzing above, you might realize a louder buzz is approaching and you look up to see a person flying around under a canopy with a giant fan on their back - a contraption called a paramotor. Meanwhile, a few friends are making music in a cave below the cliff edge. 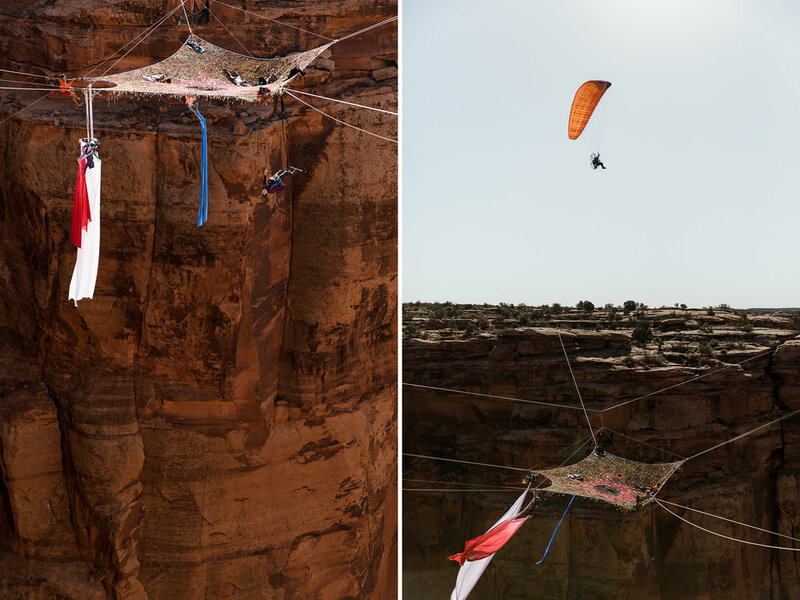 A few people are getting their harnesses on so they can shimmy across the lines to a big net to watch the BASE jumpers fly off. 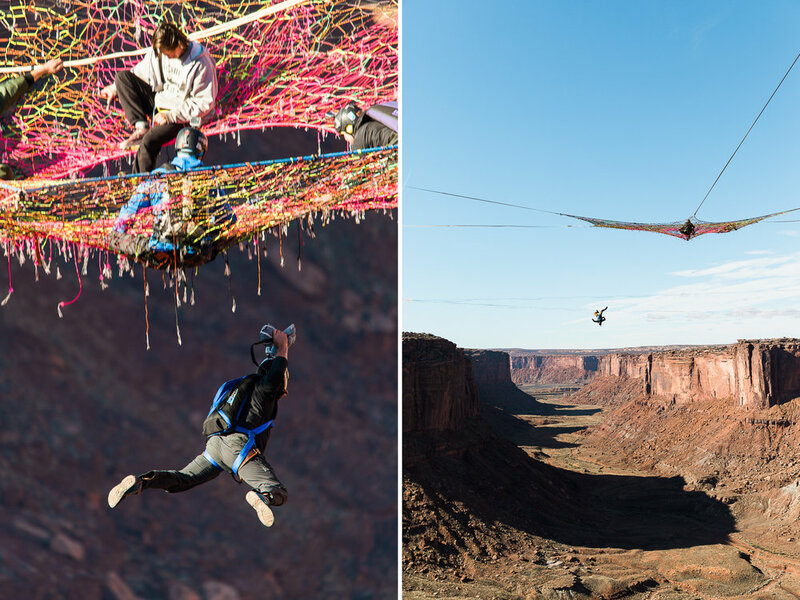 Before you know it, you hear another holler, but no parachute opening, so you look back to see two people have just jumped at the end of the bowl to do a 200-foot rope swing. The antics continue, from sun up to sundown, as the monkeys gather in the desert to play in their giant playground. There is no such thing as a normal day here. 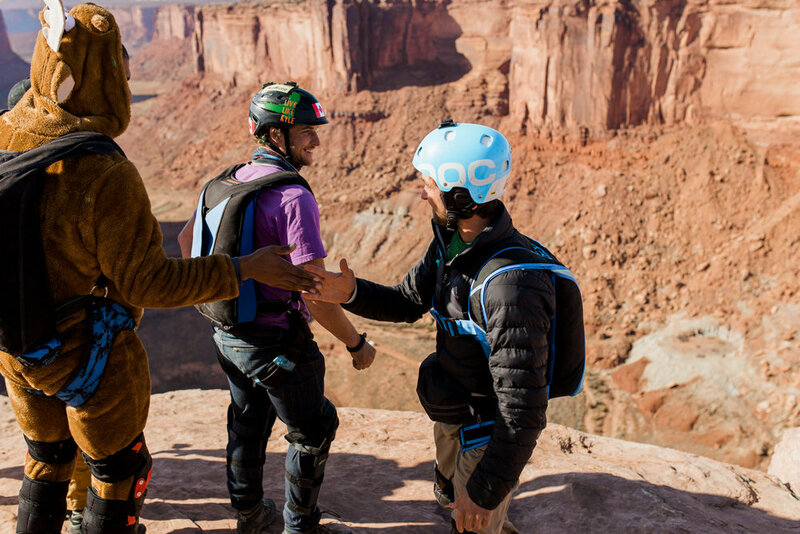 Every year, during the week of Thanksgiving, hundreds of adventure-seekers from all over the world come to the desert for this event. 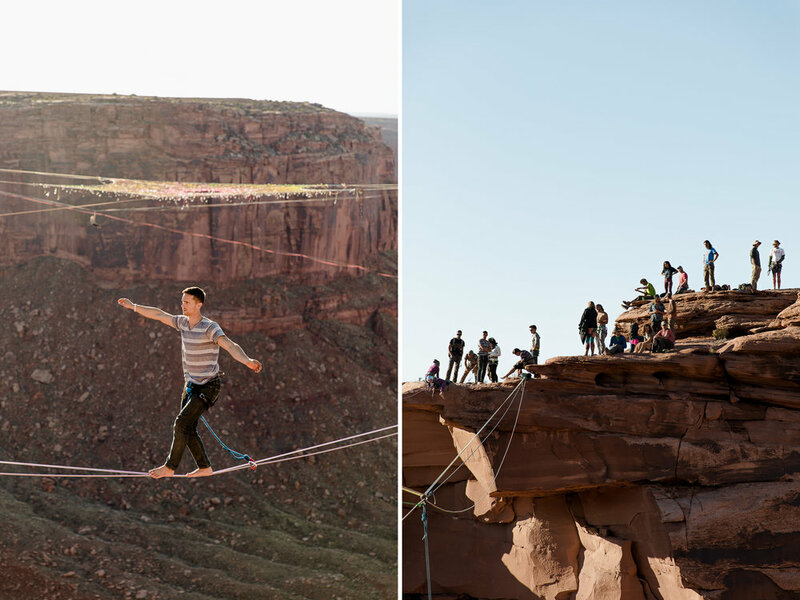 Highline walkers gather in one area to walk across 400 foot drops and play in a “space net” during an event called GGBY. 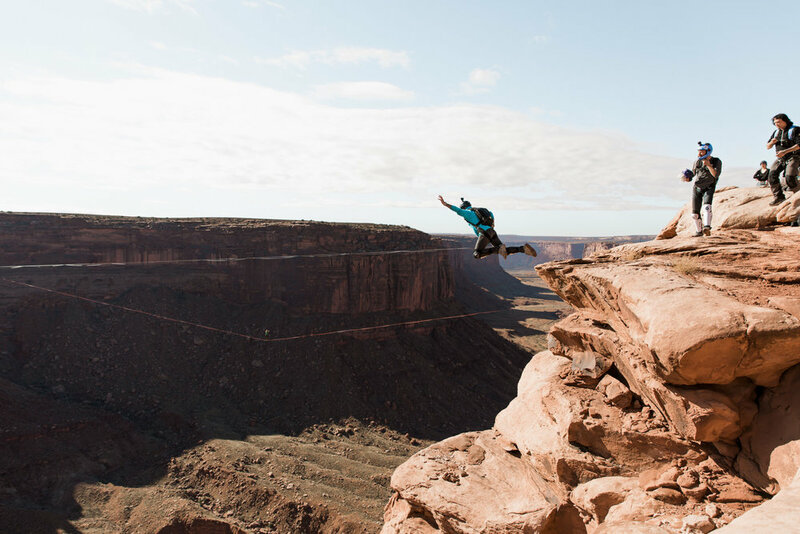 Meanwhile, BASE jumpers huck themselves off relatively low Moab cliffs during another event, Turkey Boogie. 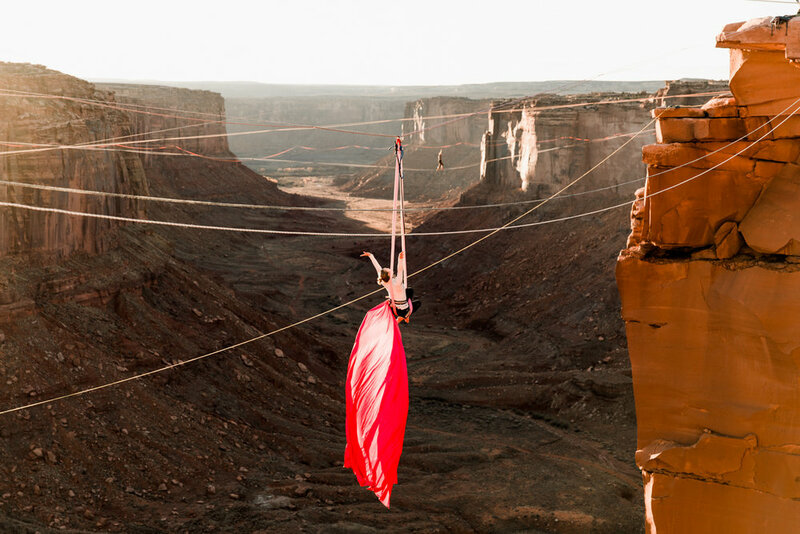 GGBY/Turkey Boogie bring together people with many talents - including acrobatic silks, yoga, paragliding, BASE jumping, music, and so much more. 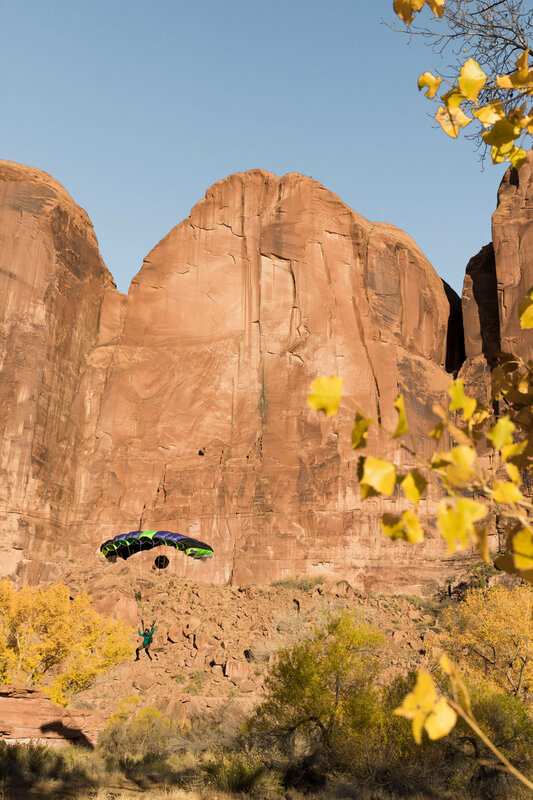 As an extreme outdoor sports and adventure photographer, Moab is a already a dream land, but Thanksgiving week is out of this world!